In preparation for the upcoming election this Tuesday in the State of Israel, the religious parties UTJ and Shas have intensified their campaigns for Orthodox votes, claiming that their presence in the Knesset is vital to protect the Orthodox, particularly now that they are, for the first time, facing the threat of forced conscription. In the past, prominent opponents of participation have included the Satmar Rebbe, the Minchas Yitzchok, the Brisker Rav and the Chazon Ish. Most recently, those who oppose participation include Rabbi Yitzchok Tovia Weiss, Rabbi Moshe Sternbuch, Rabbi Yaakov Blau, Rabbi Meir Brandsdorfer, Rabbi Avrohom Yitzchok Ullman and Rabbi Dovid Soloveitchik. 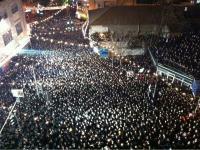 On Sunday night, Jan. 20, tens of thousands of Orthodox Jews came together at the behest of the Eidah Chareidis in Jerusalem, forming crowds that stretched for several blocks, in a rally to reinforce the policy of authentic rabbis in past generations and today: that it is forbidden to take part in the election of a country whose very existence as a Jewish entity is an insult to G-d. Speakers at the rally reminded the masses that boycotting the election means boycotting the Israeli government and all of its actions. Faithful Jews do not vote in their elections, do not accept their funding, and certainly do not want to help the state by serving in its army. The Orthodox community wishes to have nothing to do with the state at all. The large crowds underscored the fact that 64 years after the establishment of the state, there are still countless tens of thousands of Jews who have not surrendered to Zionism, and continue to proclaim loudly and clearly that the Zionist state does not represent the Jewish people. We hope to have more details on this gathering later in the week. The idea of participating in the state in order to fight it from within originated with Agudath Israel, a group founded in Germany in 1909 with the purpose of fighting Zionism. Sadly, over the years many adherents of this view seem to have forgotten their original purpose and are now full partners in the state. They still claim to fight from within, but let us take a moment to analyze exactly what they are fighting for. Reading between the lines, however, we get the impression that Maklev is only concerned about the yeshiva students, not about other Orthodox anti-Zionist Jews. If elected and given enough influence, the most his party will do is make sure those currently studying in yeshiva don’t have to serve. The problem here is that Gafni, Yishai and the others, who have sworn allegiance to the State of Israel, cannot maintain their membership in the Knesset if they demand that their constituents should not have to serve at all. The most they can ask their Zionist masters for is that those currently studying in the yeshivas should be exempted. It is clear that in this case, the religious representatives will not be able to protect those who vote for them. After the elections are over and a government has been formed, whether the Orthodox will have to join the army will not even be under discussion. The only discussion will be “my son or your son” - how to determine who is studying Torah with enough diligence to deserve an exemption. The time has come for the school of thought that advocates participation to reconsider. It is now clearer than ever that the only way to ensure that our community will not be forced to fight in the Zionist army and succumb to the state's other demands is by completely staying out of the Knesset. Click here to read pamphlets against voting in Hebrew.